Professionals and patrons could soon be breathing new life into a landmark building in Joplin. Connect2Culture, in partnership with other arts groups, has secured the necessary funding for initial architectural plans to transform Memorial Hall, 212 W. Eighth St., into a community cultural arts center. The groups were able to raise $65,000 within just 35 days of gaining approval from Joplin City Council. 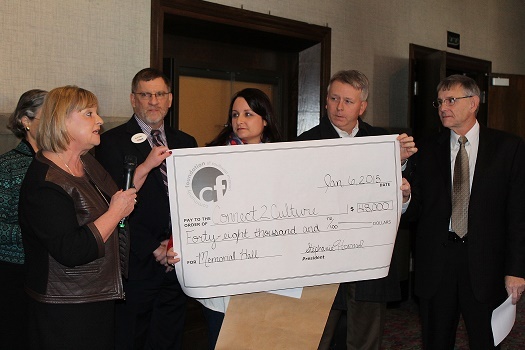 The Community Foundation of Southwest Missouri presented Connect2Culture with the lead donation, a check for $48,000, during a press conference on Jan. 6 at Memorial Hall. The money will be used to secure the services of architects Corner Greer and Associates of Joplin and Westlake Reed Leskosky of New York City to carry out a feasibility study and develop two design plans. The first plan will retain the existing facility with necessary additions, and the second involves razing the building and starting from the ground up. The donation was made from Joplin’s Tornado Recovery Fund. Connect2Culture is working in partnership with the George A. Spiva Center for the Arts, Pro Musica and the Downtown Joplin Alliance. A top priority in the development, Wert said, is preserving all veteran’s memorials located in the building and providing a meeting room for the Joplin veteran’s group. Design plans include a 500-seat proscenium performance hall, community spaces, meeting rooms, art offices and an overhaul of the parking lot. It would also serve as the new home for the George A. Spiva Center of the Arts, which has outgrown its Third and Wall Street location.